Getting a library card can transform your life. Ledyard Library offers the resources and programming you need, whether you’re looking for a job, starting a small business, trying a new hobby, or pursuing a degree. From online tools to in-person training, there’s something for everyone at the library. 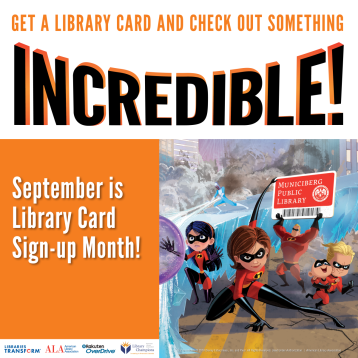 September is Library Card Sign-Up Month, so visit your library or www.ilovelibraries.org today. Read a book, play a game or do a puzzle on Tumblebooks for kids. Ledyard Library is sponsoring a contest this month in honor of Library Card Sign-up Month. Stop in either library or visit our booth at the Farmer’s Market on September 12 or September 26 and tell us why you think your library is “Incredible!” for a chance to earn prizes. The contest runs through September 30, 2018. This entry was posted in Uncategorized on September 13, 2018 by Ledyard Library.